Yay! 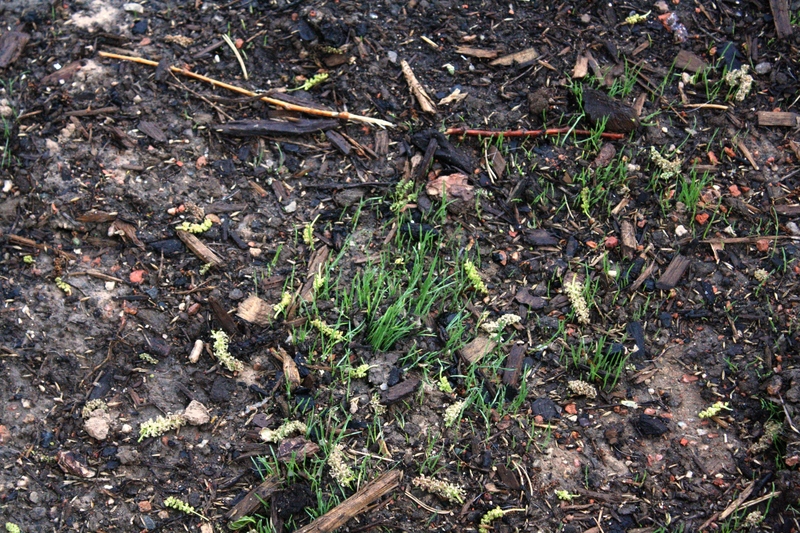 We have grass! It’s not much to write home about, but it’s green! Which means a lot when you live in a water conservative desert city. 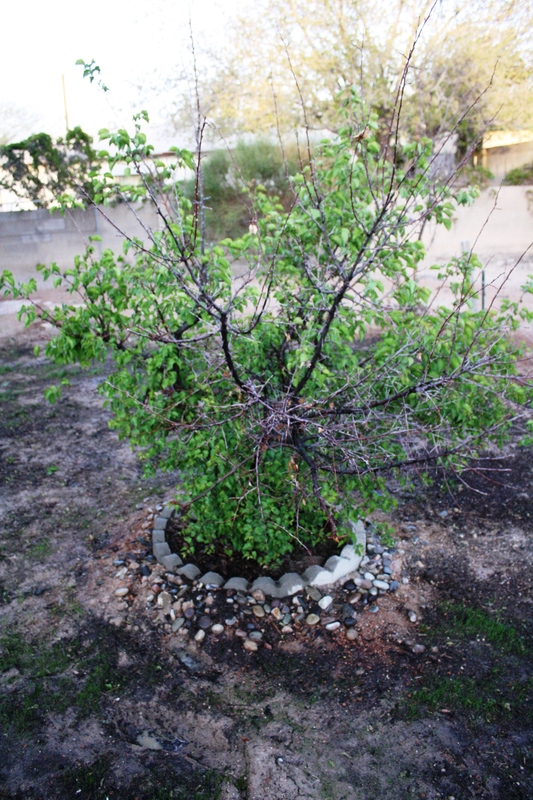 And not only do we have green grass, but the apricot tree is sort of coming back. Speaking of dogs, the grass would be greener and more plentiful if it could actually be watered. Annie and her assistant Goldie, tend to enjoy chewing on hoses, and rendering them useless until being meticulously repaired by Bubba. Hopefully these poor unfortunate souls can be repaired and re-used in the front. I know you can’t count them, but there are FIVE hoses there. 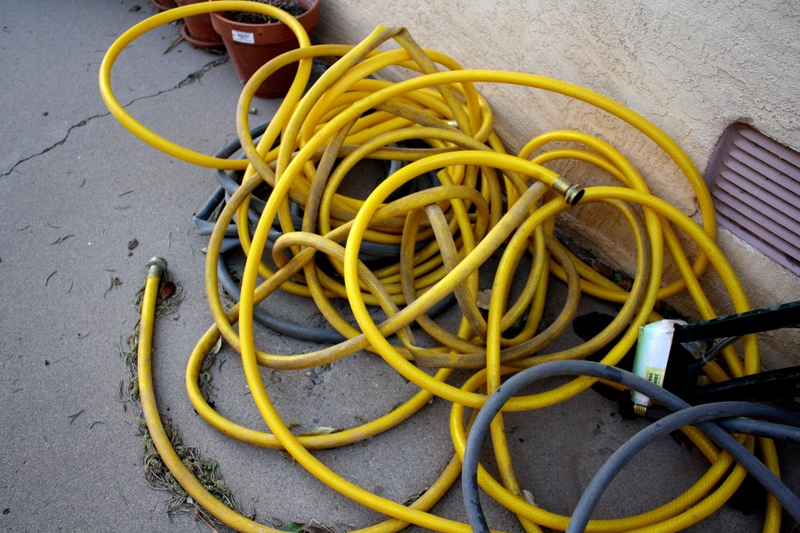 Five hoses that watered the once pretty yard. Five hoses that only lasted a couple of weeks, sometimes a couple of days, due to the rotten beastlys that I have chosen to share my yard with. Numerous methods of curtailing the hose chewing have been attempted. We have used a quick connect, to remove the hose entirely from the yard, hence, removing any temptations from Annie’s habitat.This didn’t work, because it curtailed our watering habits since the hose needed to be brought in from outside the yard and connected to the faucet. 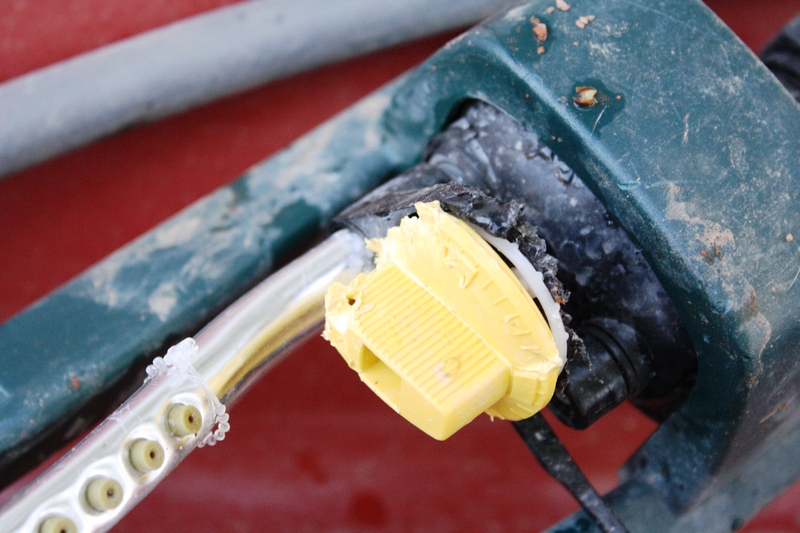 Then, we used a hose reel. This worked pretty well, as the hose lived inside a box, which effectively concealed and protected it from our canines. 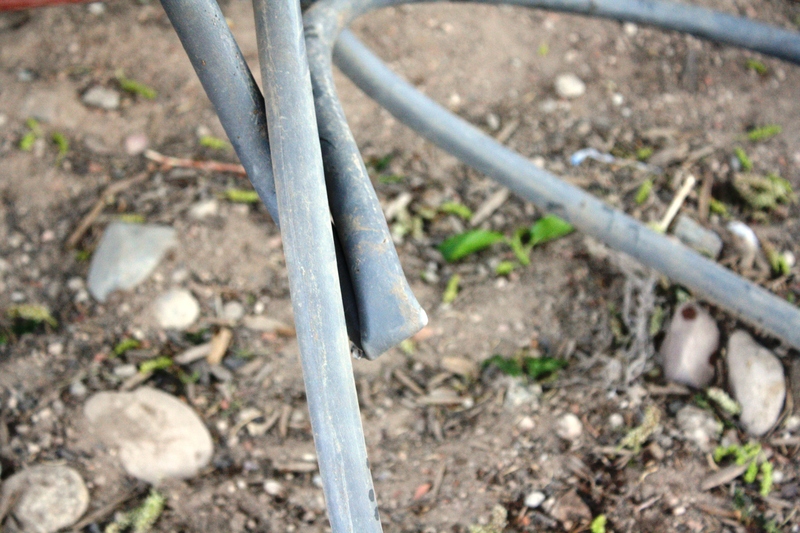 However, the tangled mess that became our hose was too hard to deal with. Frustration ensues…So to end the frustration, I am currently looking at some different watering options, but that’s a whole different post. The hoses and sprinklers are not the only things getting injured around here. 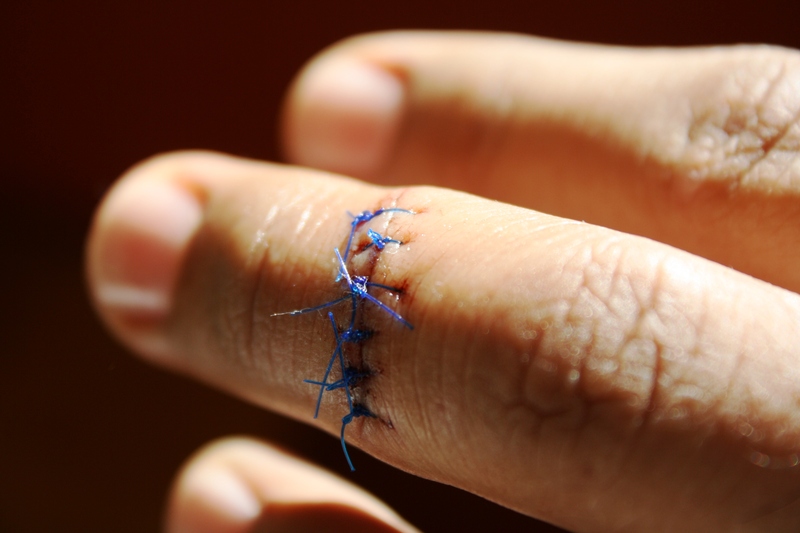 Friday while Bubba was trying to repair yet another chewed up hose, he cut through the hose and through his finger.EEK! Three hours at the urgent care and six stitches later he was good to go. That look of utter disgust is just hiliarious. That’s the look I want my doggies to make the next time they try to chew through an expensive hose. Of course, I don’t want them to get hurt, I just want to discourage the hose chewing and plant-eating a bit. By the way, does anyone want two “free” dogs?